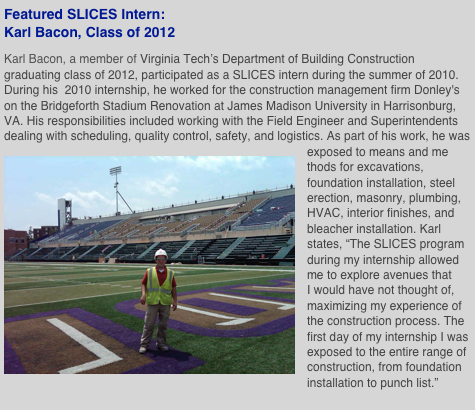 The innovative and award-winning Synergistic Learning & Inquiry to Characterize the Environment for Sustainability (SLICES) Internship Program is now available to prospective students as a formal undergraduate course within the Myers-Lawson School of Construction curriculum. This program is a synergy between students, faculty, and industry that builds on the traditional summer job experience in industry and provides students with course credit for conducting a benchmark study of the company for whom they are working. Students go through a “boot camp” the semester before their internship to learn about sustainability in the construction industry and develop skills to enhance their managerial resourcefulness. During the summer, they spend 9-12 weeks working as an intern for a firm in the construction industry, while concurrently learning more about the company and benchmarking the company’s practices related to sustainability. The data they collect is assembled as part of an ongoing benchmarking study of sustainability best practices in the construction industry. The SLICES program offers multiple benefits for the various stakeholders involved. Student interns have an opportunity to actively engage in learning more about their companies during their employment. The data collection protocols used by students are an opportunity to discuss leading edge sustainability best practices with their employers and explore how those practices work (or don’t work) in the field. Students report that the focused data collection experience helps them better understand the philosophy of their employers and supports making better choices about what type of company they would like to join following graduation. Participating companies benefit from increased structured interaction with their student interns and have the opportunity to learn about sustainability best practices of which they may not be aware. The investment of company time in supporting the student during data collection is returned when companies receive a summary of study results that helps them benchmark their current sustainability-related practices against their peers. Many companies welcome the chance to have their interns perform a guided sustainability audit of their practices, complete with recommendations on innovations that might be a good fit for the firm. Supervising faculty benefit by having the opportunity to engage undergraduate in the process of research and obtain new sources of sustainability-related data that would otherwise be very difficult to collect. Faculty report that companies seem more comfortable being candid with interns than with formal research teams from universities, resulting in more authentic data to support research efforts. Presently, faculty from universities outside Virginia Tech are being sought to expand the program to other disciplines and contexts. The results of the benchmarking study have shown increased use of sustainability best practices in the field over time. The study findings are helping the Virginia Tech team identify some of the important barriers to implementing sustainability in practice. For more information on how to participate in the SLICES Program, contact Dr. Christine Fiori (cfiori@vt.edu) or Dr. Annie Pearce (apearce@vt.edu).